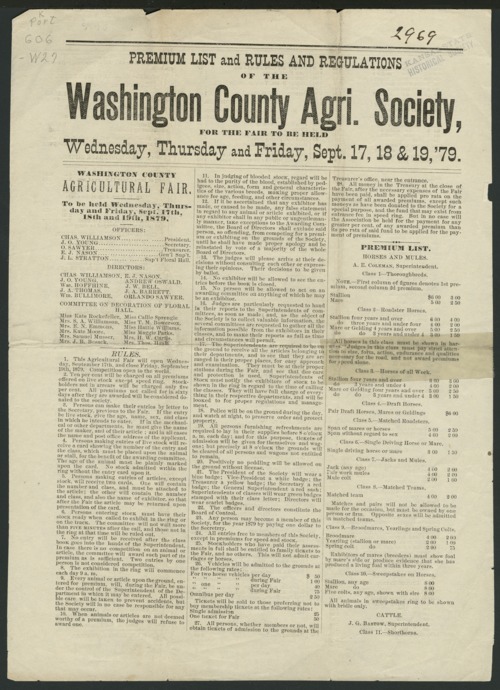 This is an advertisement for the Washington County fair that's to be held September 17-19, 1879. It lists the rules, regulations, and premiums for the fair as well as the program for all three days of activities. Fair officers include Charles Williamson, president, J.O. Young, secretary, O. Sawyer, treasurer, E.J. Nason, general superintendent, and J.L. Stratton, superintendent floral hall. A number of other people assisting with the fair are listed also.